Visit our new photo gallery on Mushrooms of Ojibway. Friday, November 30: Dandelions Taraxacum officinale, and Sand Rockets Diplotaxis muralis, are still in flower around the nature centre. The mild weather has resulted in numerous late sightings such as Yellow-legged Meadowhawks to November 23, Southern Lady Beetles (today), Eastern Garter Snake on November 14, Painted Turtle on November 16 and Little Brown Bat on November 26. Wednesday, November 14: A Northern Saw-whet Owl was found today in one of the spruce trees behind the nature centre. Another Saw-whet was killed by a car on Matchette Road last night and an amazing 36 were banded at Holiday Beach Conservation Area last Sunday night. The red phase Eastern Screech-Owl is still using the nesting box in front of the nature centre. Monday, November 12: Leaf drop is nearly complete at Ojibway. There are still a few oaks with leaves and the willows along the creek retain most of their foliage. Thursday, November 2: This is a good time to hang a sunflower seed feeder. 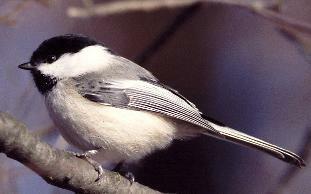 Black-capped Chickadees have been moving through the local area recently and are easily attracted to feeders. This is the first major influx of chickadees in eight years. We heard from Phil Roberts today that a Snowy Owl was seen at the Windsor Airport on Oct. 27 & Oct 31. and seven Northern Saw-whet Owls were banded at Holiday Beach on Oct 30th.